If we're talking about banners. Defently no union jacks. We're a Scottish club and plus we don't play in royal blue. There is a Morton bus going to the game next week and it won't be full. If anyway one wants to go up its £10. Message me if you want to go. there is a pub in Hamilton not far from the ground i went to last time maybe a 10-15min walk! think its a bit of a Rangers pub but that may have just been because they were playing a early kick off that day! Decent wee boozer with tons of tv's and decent food! im driving that day but id happily transport 4 other staggies from Edinburgh way! Heres a picture i threw together. this for a flag is a nice design although people may have difficulty seeing it from a distance. Bit busy I'd say!! Very tartan tho which is nice! But hey let's walk before we can run! With such a good feeling going into the accies game this weekend we need a noisy vocal support! Any word how tickets are selling from the black isle supporters club bus!? There is a pub in town called Bar west that could be a decent meeting place for pre match drinks?? Let's start getting some wheels in motion on this! (03-06-2012, 11:44 PM)Slatefordstag Wrote: There is a pub in town called Bar west that could be a decent meeting place for pre match drinks?? Sounds like a plan. I think we'll be getting into Hamilton round about 1:30pm so that leaves time for a pint or two (with the speed I drink at, probably half a pint). If anyone is travelling to Hamilton from Glasgow then I would advise meeting at the Crystal Palace round about 12pm then get the 13:07 train from Central. 2pm sounds like a plan quick pint down'd then game time might break the flag out for the first time in a while!! I may get there a bit earlier, how fr is said pub from the station?? Like I said earlier I have 4 seats going thru on Saturday and back to Edi after the game first come first served PM if interested! (03-07-2012, 12:14 AM)Slatefordstag Wrote: I may get there a bit earlier, how fr is said pub from the station?? Looks to be 10 minutes, so might get an earlier train that gets in at 1:30pm, then wander over. Sounds like a plan 1.30pm Bar West. (03-05-2012, 08:39 PM)SteakpieStaggie Wrote: Me and a few flatmates would definitely be up for it, our downfall with making away games is down to pure disorganisation! need to match a face with some of the names on here as well! lets roll out the "central staggies" union jack flags! No chance, that would be 'diplomatic suicide', for lots of reasons. Especially if we got to the SPL. Like bringing an Irish tricolour or an SNP flag* to the games, not a good idea, regardless of where your allegiances lie. Basically, please dont do it!! *these are not necessarily related, just indicating the two main groups who would hate a Union flag. I'm planning Hamilton away this week, and am based in Edinburgh. Will hopefully rope another couple of folk into it and we'll try to get the singing juice flowing. You should be able to recognise me as I'll be dressed as Boadicea, complete with fake [censored] and a feminine dress made out of a Union Jack flag, and staggy antlers. Maybe more like Ginger Spice than Boadicea actually... either way the antlers will show it's all about County. 'Mon the ultras. did you honestly think i was being serious? Just unpicked the stiches on the masive flag to make a big and medium flag!! i dont have any picks im afraid! Dark Blue and red either side! Will try and get there for around 2pm or just after. So next away game for the central Staggies is Partick Thistle on 24th March whichdepending on things this evening and the coming few days this could be a rather vital game!! The pub of choice is the Woodside Inn!! Those who were in attendance will remember this as the pub of choice last time! We made a good noise at Hamilton so lets keep it going!! I'm going to be down in paisley on the 24th march and will be making the short trip to the Partick match. Going to be on my own for this one, so will probably make an appearance at the Woodside Inn for a few pre-match pints. 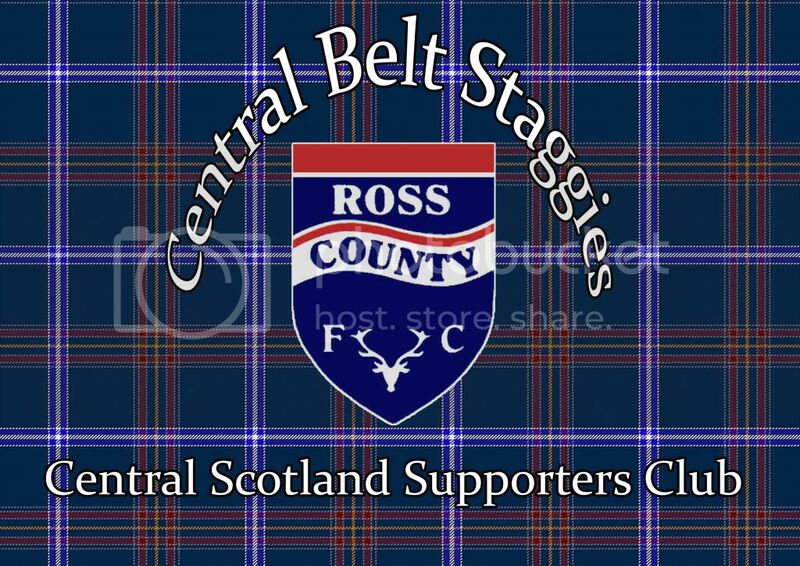 Slateford Stag, the Central Belt Supporters Club is a great idea! I usually go to the away games from Edinburgh with three or four others but it would be good to get to know other supporters. Like you said, you see the same familiar faces but everyone just seems to remain in small groups at the games. Also, I think we need to work on some new songs for the away days! (03-20-2012, 01:10 AM)lothianstag Wrote: Slateford Stag, the Central Belt Supporters Club is a great idea! I usually go to the away games from Edinburgh with three or four others but it would be good to get to know other supporters. Like you said, you see the same familiar faces but everyone just seems to remain in small groups at the games. Also, I think we need to work on some new songs for the away days! new songs is a great idea as county really only have 3 maybe 4 songs that last 10 seconds each. When i was a full time supporter when i traveled with alan week in week out we used to sing the song "weve got the best team in the land " but cause were the best team in the league we can sing "we got the best team in the league" and go through the team 1 to 11 and. at least it will last longer than 10 seconds and then were appreciating the whole team in the one song.